Cox's Bazar, Bangladesh. March 2018. Bangladesh has been hosting Rohingya refugees from Myanmar for nearly 30 years. 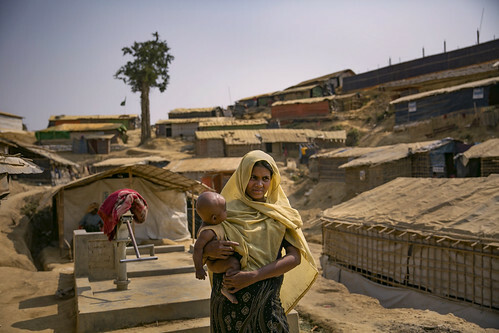 Since August 2017, some 693,000 Rohingya’s have made their way to Cox’s Bazar in desperate conditions. Of them, 51 per cent are women. 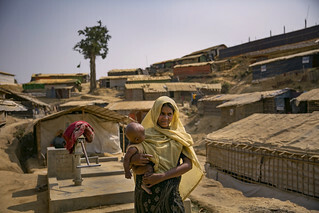 The refugee population in Bangladeshi settlements has more than doubled; camps are overcrowded, needs are immediate and enormous, and resources are stretched. Pictured: A woman walks past a water pump in Balukhali camp on 5 March 2018. As of January 2018, UN Women has set up the first Multi-Purpose Women Centre in the Balukhali refugee camp in Cox’s Bazar, in partnership with Action Aid and with support from UN Women National Committee Australia. The Centre provides a safe space for Rohingya women and adolescent girls, where they can build a social network, access information and referral services for gender-based violence, and seek psycho-social counselling. The centre also offers skills training in literacy, livelihood options, leadership and disaster preparedness, and raises awareness about gender issues and risks.